Several years ago, Tristen was running across a playground when he smacked into a head high vertical pull up bar. None of us could see it, as it was getting dark. From my view point, it looked like he'd broken his neck, and I swear my heart stopped when he crumpled to the ground. Thank goodness, he was not broken, just bruised, bleeding, and missing a good chunk of his front permanent tooth. So, we take him to the dentist and have it fixed. 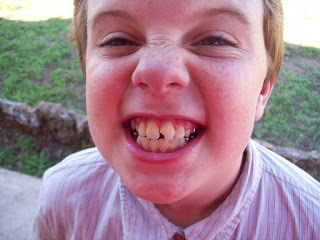 A month later he was visiting his great grandparents when his cousin punches him in the mouth, knocking the fix out and revealing the chipped tooth again. And so it began, he'd have it fixed for awhile, then some awful thing would happen and he'd be chipped again. The last fix held the longest, over a year. Then he came home from school today looking like this. He says he did it with his tongue. Do we fix it again, or wait until he's older and truly cares how it looks? This is getting old and he honestly thinks it's cool. Boys! Cute! I have something for you at my little ol' blog...Have a great weekend!